This is the Latest Mod of Dream League Soccer 2019 which features the UEFA Champions League in it. This Dream League Soccer 2019 Dls 19 Champions League Mod comes with the Latest transfers you can think of. I have provided the Free Download Link of the Android Game. Dream League Soccer 2019 MOD Uefa Champions League Edition is not the Official DLS Game but a Modded version of the Dream League Soccer 2018 (Dls 18) App which the download link is also available on this site. This Champions League Edition is very addictive and will satisfy you till the release of the Original Game. As you already expected, this Dls 19 Uefa Champions League 2019 Update comes with unlimited Money, Unlocked players and Fully Modded HD Staduims. 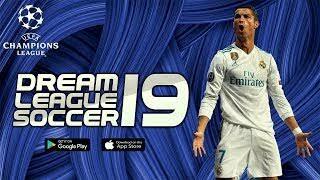 Below are some Features of Dream League Soccer 2019 MOD UEFA Champions League (UCL Edition) Apk + Obb. 6. New UI For Player Card. 10. The Control Buttons are now cooler. 11. New Looks on Dream League Soccer Champions League Radar. 2. Extract using zarchiver App ( Password Above). 6. Play dls 19 champions league edition for free. Nice!! Nothing beats the UEFA Champions League... Downloading right away! !